Today was quite a day…Working in Student Affairs is sometimes very rewarding, but it is can be just as tiring at other times. Today was one of those tiring times. Closing a housing program at the end of a semester can be quite challenging, but then add to it the requirement for students to follow a specific set of directions and everything goes out the window. Still, I found about five minutes to bring my menorah into the office and sit in peace and quiet. 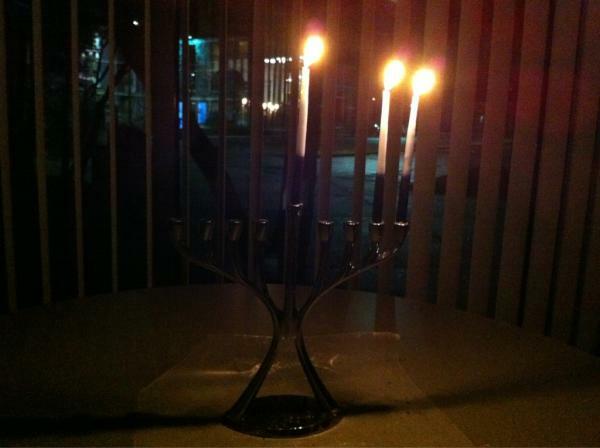 I am not always a fan of celebrating Hanukkah by myself. Since I lived away from home for five years and had not found the right Jewish community for me, most of my lighting moments have been in solitude. For today, I was comfortable with getting the moment to sit in peace and watch the flickering of the flame. It was one of those moments that allows me to get a better sense of serenity and spirituality. The simplicity and the calm are extremely soothing and allow me to get a sense of perspective. Hopefully tomorrow brings a chance to not shove this tradition between work projects and I can truly and fully enjoy my third night.